Adam Selzer in front of the main entrance at Essanay Studios, now part of St. Augustine College. From 1907 to 1913, Chicago was the movie capital of the world. Essanay Studios, located in Uptown, made silent films featuring stars such as Charlie Chaplin, Gloria Swanson, and cinema’s first cowboy hero, G.M. “Bronco Billy” Anderson. Essanay also put out the world’s first Sherlock Holmes movie in 1916. Long thought to be lost forever, a new print was discovered in a vault in France in 2014 and recently restored. On Saturday March 12, the Chicago chapter of the Obscura Society, a group of local history buffs, will host the 100th anniversary of the film in the room where it was made at 1345 W. Argyle Street. Local historian, writer and tour guide Adam Selzer spearheaded the effort to bring the film back to where it was made. The Chicago Ambassador met with Selzer at the Essanay soundstage in Uptown to talk about the film, Essanay and his new book which promises to be a new and accurate take on infamous killer H.H. Holmes. Inside the old soundstage at what was once Essanay Studios, 1345 W. Argyle Street. 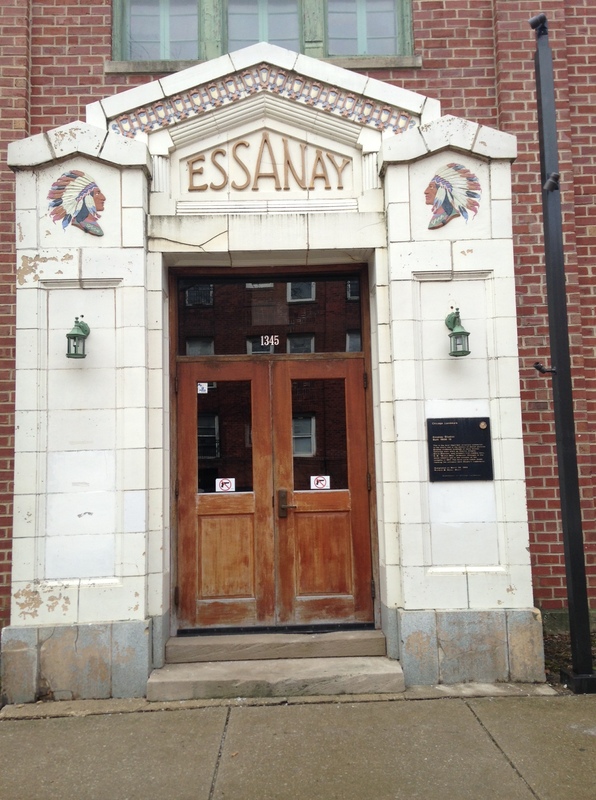 The main entrance of the long-gone Essanay Studios still bears its name and logo. CA) How long was Essanay around? SELZER) It started in 1907 and lasted about a decade. CA) Did it end because of the advent of sound in pictures? SELZER) Not necessarily. It was still well before sound came into play. More and more, Wall Street began investing in other studios. And it was also because they [Essanay] managed to lose Charlie Chaplin. It was a series of bad business deals. CA) Were Chaplin’s biggest films made at Essanay? SELZER) No, no, He made several big ones with Essanay and became a much bigger star while with them, but he was only with them for a year. After that he went to California. CA) So everything started to move west? SELZER) Yeah, everything started to move west around that time. There were a variety of reasons for that, but the weather was the most obvious. 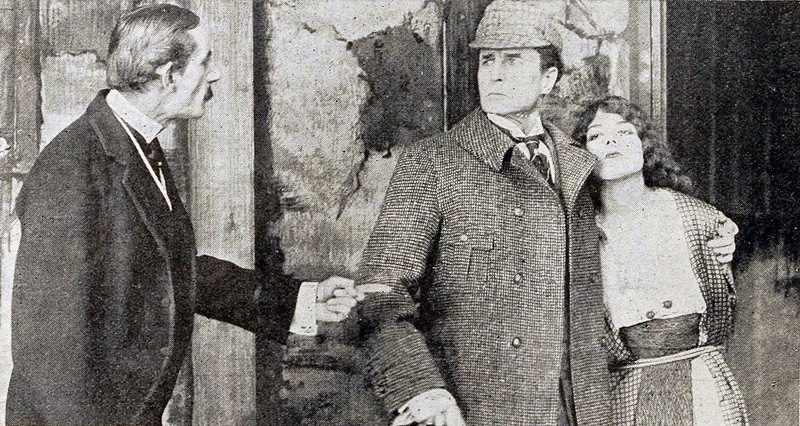 CA) This Sherlock Holmes film was thought to be lost until someone found a print in 2014? SELZER) Somebody found a print in a vault in France. There are only a few surviving films that were made here at Essanay, and one of the big lost ones was the Sherlock Holmes film. It was the first full-length Sherlock Holmes film ever made. Then it was lost for years and years along with any record of what William Gillette [who played Sherlock Holmes] was like as an actor until a couple of years ago. William Gillette as Sherlock Holmes in the 1916 movie made at Essanay Studios. CA) Who was it that had the film? SELZER) I can’t remember offhand, but it somebody associated with films. CA) How did you find out about it? SELZER) I saw an article in the newspaper. It was around the time I was finishing my book on the silent film era in Chicago, [Flickering Empire: How Chicago invented the U.S. Film Industry]. CA) Were they receptive to your interest? SELZER) Yes, they actually sent me some stills to identify where in Chicago it was filmed. CA) Were you able to figure it out? SELZER) They were scenes in an alley, which could have been in any alley. I’m guessing it was in the lot at Essanay. SELZER) Yes, and immediately I thought it would be great if we could show it where they filmed it. [Looking around at the soundstage] This is the room, this is where it was filmed and where they had all of the sets that looked like Baker Street. CA) Will you have an organ player for the showing? SELZER) The event will feature a piano player and cellist, who composed a live score to go with the film, along with Sherlock-themed cocktails from Lincoln Park restaurant Knife and Tine. 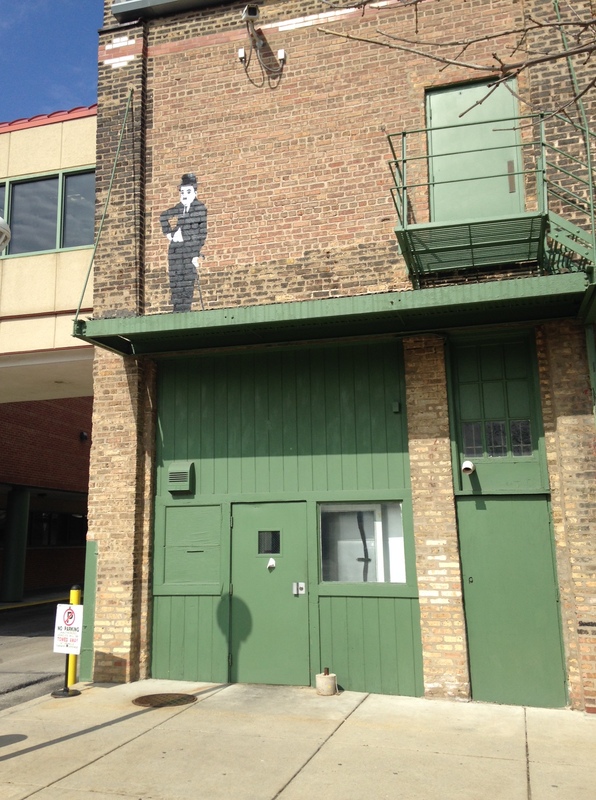 Small tributes to Charlie Chaplin, Essanay’s biggest star, are located in various spots on and around the building. CA) This is now owned by St. Augustine College? CA) What do they use it for? SELZER) They use it for meeting space and as an auditorium. I don’t think they don’t use it for much however. CA) Are there any other remnants left aside from this soundstage? SELZER) Down in the basement there is still a vault that says “safety film only” on it. There is not any actual film in it, there hasn’t been for years and years. But it still says it. There are little traces here and there. CA) The school [St. Augustine College] was open to allowing you to host the film? How long have you been coming here? 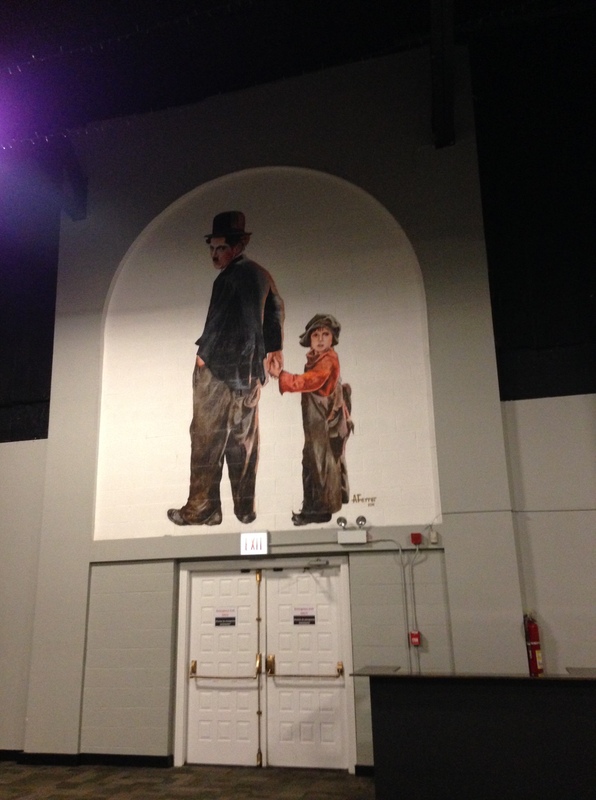 SELZER) In 2011 I was doing a podcast and decided to check out the old silent film studios in Chicago. There are two of them. There is this one [Essanay] and the old Selig Polyscope studio at Byron Street and Claremont Avenue. That one is condos now and it’s not quite as intact as this. The building is still there and they still have the diamond S logo above the door but that’s about it. 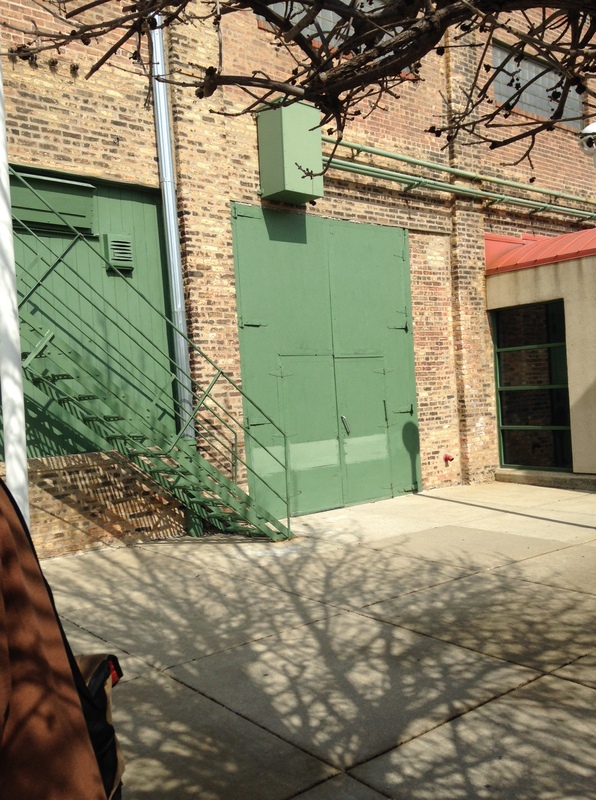 The oversized doors (to move props in and out) still exist on the outside of the old Essanay Studios building. CA) You are known for writing a number of Chicago-related history books. But you have also written some young-adult novels, correct? SELZER) Yes, quite a few. CA) Any plans for any adult novels? SELZER) Not at the moment. The one I have coming out in the fall I wanted to make an adult novel, but the publisher pushed me to keep it an under-18 novel. CA) What is it about and when will it come out? SELZER) It comes out in August. It’s called Just Kill Me. It’s about a ghost tour guide who makes places more haunted by killing people at them. CA) You’re originally from Iowa. When did you move to Chicago? SELZER) I just like it here. CA) Most of your non-fiction books are Chicago related. Did you study the history of Chicago in college? SELZER) No. When I moved here I got a job as a ghost tour guide, I wanted to research all the stories myself to see if the history was right and I realized that most of the ghost stories going around hadn’t been well researched at all. So I started digging deeper. Right now I’m working on a book about H.H. Holmes, the Devil in the White City guy. There are a lot of books about him, but none of them are accurate. Everybody has based their stuff on a couple tabloids and pulps. SELZER) Yes. He relied way too heavily on a couple of 1940s and 1950s sources. CA) What are the main differences? SELZER) The main differences are that he [Holmes] never operated a hotel. He said he was starting a hotel to swindle people, but nobody ever checked in or stayed there. He certainly didn’t kill 200 people there, there were no torture chambers in the basement. It was all a big swindle. CA) He was a killer though, right? SELZER) He killed 9 or 10 people. It wasn’t 200. CA) When will that book be finished? SELZER) It’s due in 3 weeks. The draft is about 900 pages long. They asked for about 150,000 words, it’s at about 180,000 right now. I’m also almost done with a book on Mysterious Chicago, which is about unsolved mysteries from Chicago history, some of which have never been written about since they were in the newspaper 50 years ago. CA) Do you have any role models or people you look up to who have done the things you’re doing? SELZER) Indiana Jones, who taught me that we cannot afford to take mythology at face value. That’s a line I use quite a lot. He’s really the main one. CA) What has attracted you to the obscure history subjects? SELZER) Really its the treasure hunt of trying to find stuff and find the stories to back it up. I love digging through the legal archives, trying to find a little data. It appeals to the collector mentality inside of me. CA) Have you ever thought about teaching? SELZER) I don’t think I have the credentials to be a teacher, but if someone gave me a job to teach I would take it. A tour guide is kind of a similar skill set. It’s like being a teacher without the red tape. CA) How often do you do tours? SELZER) This year I’m doing 4 or 5 a month. Last year I did about 200. For the last 10 years I’ve done 200 to 300 a year. CA) How much of your income is from doing tours as opposed to your books? SELZER) One year it’s 80 percent from tours and 20 percent from my writing. Then the next year it’s the opposite. I’m hoping to get 80 percent from both sometime soon. To find out more about Saturday’s showing of Sherlock Holmes, click here. To learn more about Adam Selzer’s books and tours, click here.